"There are so many trails behind our houses on this island. This photo shows the problem we have with waste. While exploring the paths behind my community I discovered a place where people dumped things like cars, bikes, and barrels. Discovering places like this can help us move forward in conserving the land and making sure our island stays clean." Pandora was one of six winners of Special Distinctions in the 2017 edition of our high school art contest. View the rest of the entries, then check out the Winners' Gallery, complete with written descriptions by the artists themselves! Thursday, Oct. 19, 3:30-4:30 pm and Saturday, Oct. 21, 10-11 am, West Tisbury. Learn all about one of the Vineyard's most important and unique habitats in this free presentation and hand-on activity at the Trustees' Long Point Reservation. For kids age 8-10, for more info and directions, see website or call (508) 693-7662. Saturday, Oct. 21, 9:00-2:00 pm, Oak Bluffs. Many electronic devices and appliances contain toxic chemicals that can be harmful if not disposed of properly — and getting rid of them at the dump is expensive! Free yourself of burdensome junk at MV Community Services, across the street from the high school. 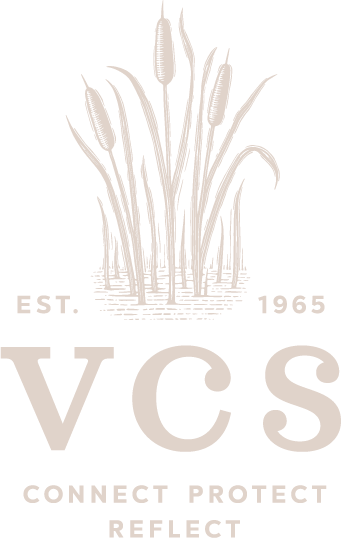 Fees range from $2 - $30 and benefit MVCS. Complete price list here, or email or call (508) 693-7900 ext. 267 for more info. Saturday, Oct. 21, 10:00 am - noon, Edgartown. Explore the unique frostbottom and hiking trails of Pocketapaces with staff from Sheriff's Meadow Foundation. Meet at the State Forest parking lot opposite Pohogonot Road. For more info, call (508) 693-5207. Saturday, Oct. 21, 3:00 pm, Edgartown. 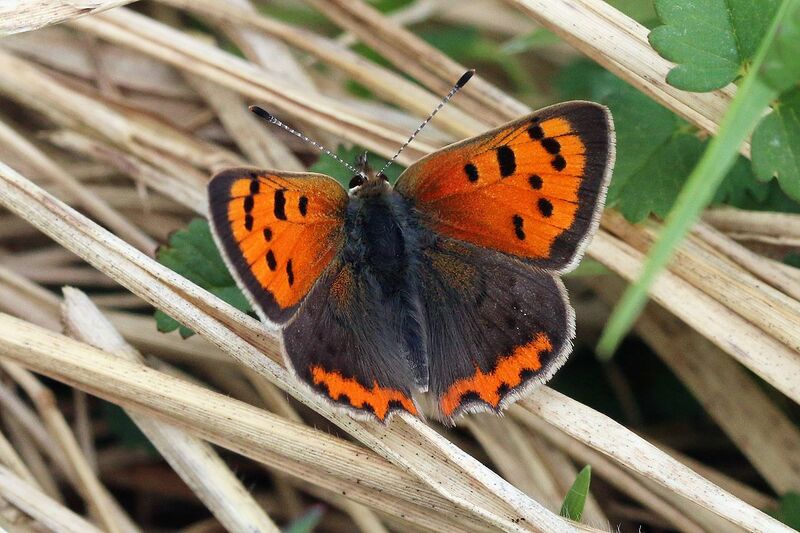 Island naturalist and photographer Matt Pelikan will introduce the Vineyard's 60-some species, including when, where, and how to find them, how to identify them, and how our mix of butterflies is changing over time. A free presentation at the Edgartown Library, for more info contact the library at (508) 627-4221. Sunday, Oct. 22, 1:00-3:00 pm, West Tisbury. BYOB in style after attending this sewing workshop led by Sarah Vail at the West Tisbury Library. Free, but registration is required, and you must bring your own materials. More info at Library website. Mill Brook is a true freshwater stream that meanders all the way from North Road in Chilmark, across State Road in West Tisbury, and eventually via Town Cove into the Tisbury Great Pond. Along the way, the water temperature rises considerably, largely due to the multiple artificial ponds created by dams and other barriers to the free flow of water. The ponds slow the flow of water, and spread it over a wider area, allowing for more build-up of solar heating. 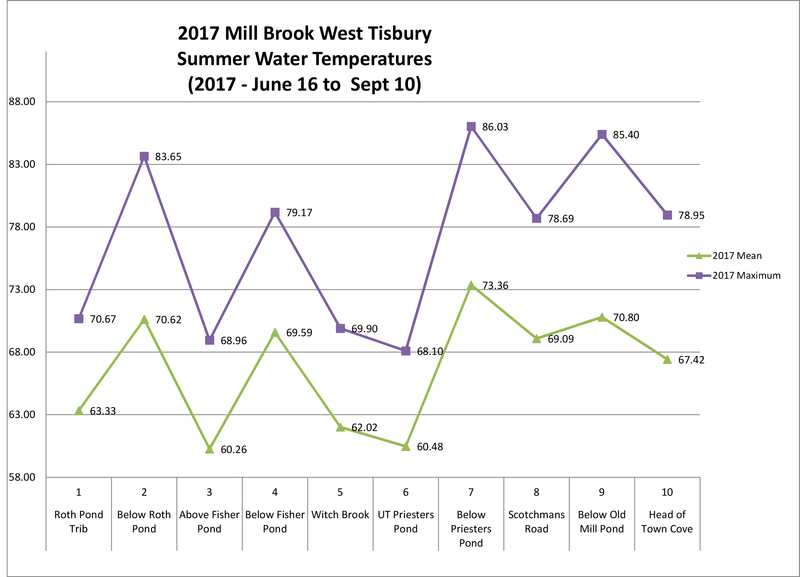 For the past five years, the Mill Brook Watershed Study has been recording temperature data throughout the summer using automatic sensors and data loggers placed at multiple locations along the stream. 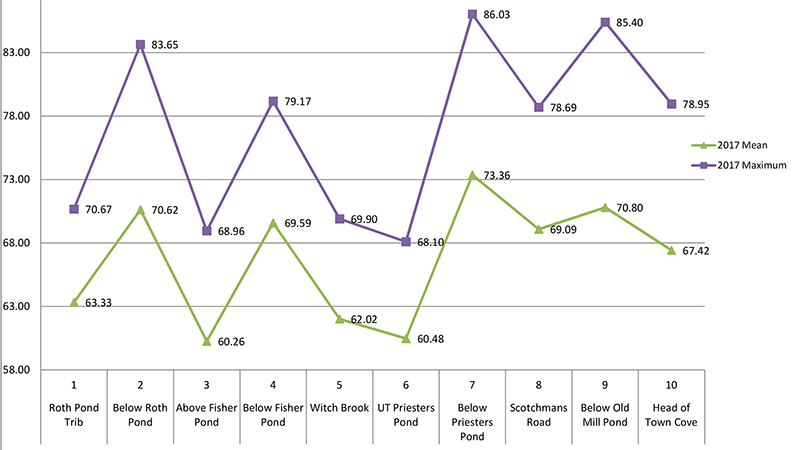 While the temperature rise from the headwaters to Town Cove has been consistent from year to year, it is not at all consistent along the length of the Brook. Instead, as shown by the above graph of this summer’s data, temperature spikes are seen right after each pond, followed by a partial return to the pre-pond temperature. This is why dam removal is such an important goal in the broader effort to restore freshwater streams to their natural ecological function. 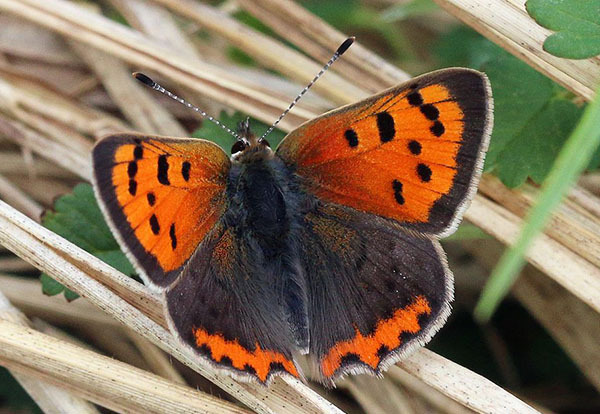 Beyond the physical obstructions, which can be partially mitigated by workarounds like fish ladders, the ponds create thermal barriers separating portions of stream that could otherwise be good habitat for heat-sensitive species. It is not nearly as visually apparent as a highway running through a forest, but these hot spots are in effect yet another form of habitat fragmentation. While we believe the declaration of victory in the “War on Coal” by EPA administrator Scott Pruitt is both premature and overconfident (see “quote of the week” above), it’s only fair to acknowledge the opposition has had a productive couple of weeks. On Monday, Mr. Pruitt announced that his agency would be abandoning the Clean Power Plan, regulations that would have reduced carbon emissions and toxic air pollution from coal-burning power plants. This comes immediately on the heels of last week’s nomination of a coal industry lobbyist (and former aide to Senator James Inhofe of Capitol snowball fame) to be Mr. Pruitt’s right-hand man at the EPA. The timing is entirely a coincidence, however, as Mr. Pruitt certainly doesn’t need anyone to convince him that his agency’s plans to limit coal were too onerous. In his previous role as Oklahoma Attorney General, he spent considerable effort on behalf of the coal industry in suing the agency he now heads 14 times, usually over attempts to regulate air and water pollution. Further, if anyone were to try to change Mr. Pruitt’s mind regarding anything, they soon may need to overcome a $25,000 Cone of Silence the EPA plans to install in his office. Of all the various excuses offered to not do anything significant to reduce carbon emissions, probably the most (maybe only) valid one is the economic argument that by burning less coal and oil we depress the market for those commodities. That lowers the price for developing nations, allowing them to burn more fossil fuels, boosting their economies (at least in the short run) while the United States “sacrifices” our right to superficially cheaper electricity, toxic air pollution, heavy metals in groundwater, and smoother, less imposing mountaintops. It is a cynical attitude, but unlike attempts at outright denial of climate science it’s not factually wrong on its face. The truth is, if we seek to avert global climate catastrophe, we may have to take a bit of a leap of faith: to believe that international cooperation is possible; that nations can balance their long-term interest against immediate gratification; that people won’t fall for demagoguery that frames everything – even air pollution – as a contest among nations. The encouraging thing is that to substantially reduce global emissions from their current pace we don’t even need all of those things to be true all the time – just some of them, sometimes, should be good enough. That’s not asking for an unreasonable degree of optimism about humanity – just realism.